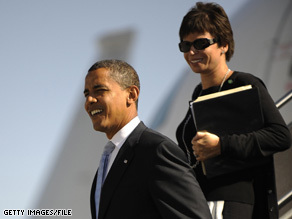 Valerie Jarrett, a senior adviser to President Obama, will head the White House Women's Council. WASHINGTON (CNN) - President Barack Obama is planning to sign an executive order on Wednesday that will create a White House Women's Council overseen by senior adviser Valerie Jarrett, according to two senior administration officials. The officials said the president will make the official announcement at the White House and is likely to be joined by his wife, first lady Michelle Obama. One of the officials said the president wants the office to "have a presence at the White House to address the issues facing women and girls," including pay equity and the balancing act working mothers face. Wonderful ! It is about time that women had someone helping them with their problems. Good job President Obama ! Good grief! anything to try to keep the votes of the lame-brained women who will fall for this crap. The feminist movement has accomplished this: Many women, now, MUST hold a job outside the home even if they would RATHER be home because men are now expecting it of their wives. Quite the foolish "accomplishment" I say. Let's turn it around, ladies!!! Back to home-made children, bread, cookies and good old home-making. That's where the good life is. Been there, done that, and absolutely NO regrets!!! Obama the Great Creator...of governement positions for all his friends, cronies. While private business is losing jobs the governement is gaining but who, in the end, pays for these jobs if no one is working to pay taxes? Excellent decision. Ms. Jarrett, a professional and a mother, is a great person to advise the administration on pay equity and work-life balance issues. Great idea Mr President. Most of our women have insights which are vital for the building of a better society. Some women have been filling in for the absent fathers, and might be able to give some insights into dealing with some of those recalcitrant House members. Ha ha ha ha ha ha ha ha.......I was wondering when she would be thrown out into the open after a low profile stinit in Davos. Another useless, sleeveless appointee. Good! Finally a president who is actually going to do something about the issues facing women!! How will this "presence" to "address issues" work? Try again on the Equal Rights Amendment? Find out why women are still not treated the same as men? Expand the political pandering philosophy of "no interest group left behind"? Every woman deserves equality, especially in pay. I hope all the working women get theirs, I never got mine and it's too late. How about a Council on Women Grieving After an Abortion? Cant this be taken care of in a different dept. Do we need to create more government jobs and make the government even larger than it is? If all the tax dollars for the next few generations are going to pay for the stimulis bill(s), where is the money going to come from to pay for more government jobs? Rush Limbaugh's definition of a "Femi-Nazi" is a woman NOT belonging to any Right-wing Radical Extremist Republican groups. The Obama-Jarrett Woman's Council is in response to Limbaugh's dictatorship and will help transfer 10-million more Limbaugh female political moderate rejects" from the GOP to Obama by 2010, and another 10-million more in 2012. One parent families (that tend to be working mothers) and parents who don't pay child support are a big problem for America. We do nothing to help support and develop the greatest resource we have in our country. I would like to see changes to FMLA (4 months+ of FMLA for the mother/parent), Child Support (The government should payout and collect child support. This way, the child always gets the money it needs and the government can work on tracking down the dead beat f needed), Child Care (Not sure what we can do here but good child care is hard to find and expensive. We, as a society, need to do more to make this more available to children). Guess what Bruce? You don't have to read/comment on every story written. If you read the headline and find it irrelevant....don't read the story....good grief!